Thanks to the patented LSG technology at the base of the system, TAGFOR is an extraordinary customer loyalty, digital couponing and lead generation tool. 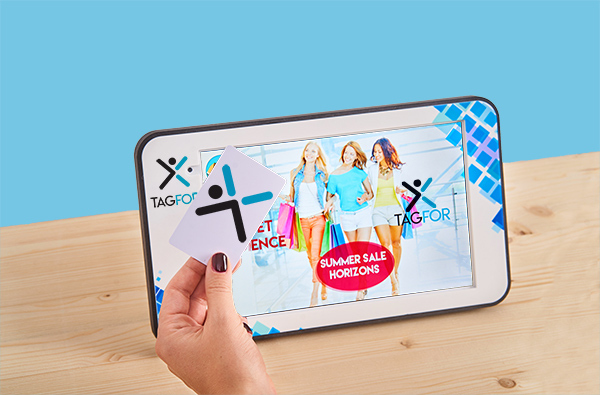 TAGFOR captures the attention interacting with the customers of a business or shop, analytically tracing all the actions that they perform on the tagbox (TAGFOR’s tablet) to offer advertisers the results of their promotions, in real time. 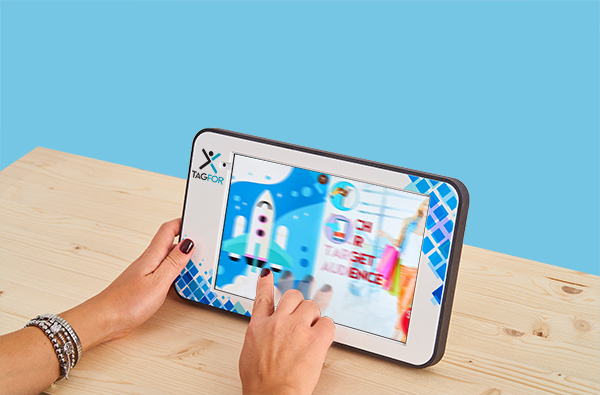 TAGFOR STAR is based on a custom NFC 10” tablet (TAGBOX) in which are integrated an interactive media and a user engagement platform. In addition to recognize and monitor individual customer views (Look), the TAGBOX promotes interaction by offering a wide range of promotions, discounts, coupons etc. proposed by advertisers. Finally, the TAGBOX tracks the actions carried out by customers: scrolling between the different promotions (SWIPE) and acquisition of preferred offers (GET). 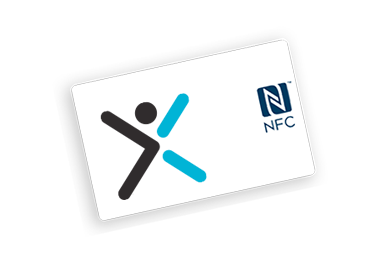 It is the card with an NFC tag that customers receives from the business owner/manager and with which they can acquire (GET) the promotions that interest them with a simple gesture on the tablet. A practical and quick way to “catch” the most interesting offers! 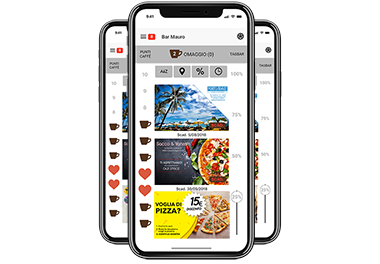 As soon as the customers get the promotion that interests them with the TAGFOR CARD, they automatically find it on their smartphone, through a special app for iOS and Android, then use them either physically or virtually in the store advertiser's store/company/ecommerce. 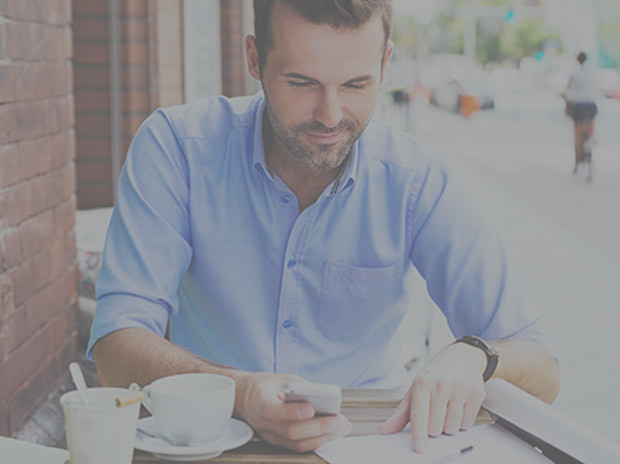 The advertisers publish their offers and promotions on the TAGBOX of a specific geographical area, and also have the possibility to monitor and analyse in real time all the views and the different interactions of users with their advertising message. In this way, the complete picture of the results (redemption) obtained from your advertising investment is always available, quickly and easily. TAGFOR is the revolutionary local marketing system and an effective and monitorable customer couponing and loyalty building tool. Customers look at the tagbox screen that registers its viewing through the patented LSG technology. 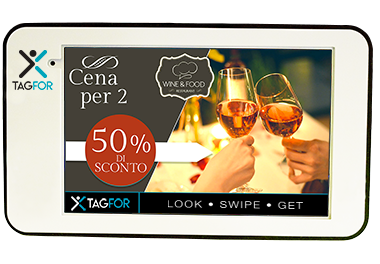 Customers scroll the various offers and promotions on the touchscreen of the tagbox, in search of the one that interests them most. 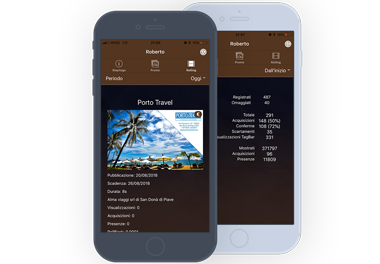 Customers, using the CARD that they received by the business owner, acquire (get) the offer that most interests them and, at the same time, they find it on their smartphone. Each with their own use and advantages! TAGFOR is the new engagement system that connects advertisers and customers through the business owner/manager’s activity. The company (TAGFOR ADV) uses the platform to reach its target during the day and acquire new customers with targeted and effective promotions. Furthermore, it verifies the results of the campaign in real time (i.e. the actions performed by users: look, swipe and get), optimizing its advertising investment and planning the next marketing campaigns based on the results obtained. The owner/manager of a business/shop (TAGFOR POINT) uses TAGFOR to build customers loyalty, offering them free drinks and promotions in his bar/business. The customer of a bar, shop etc. 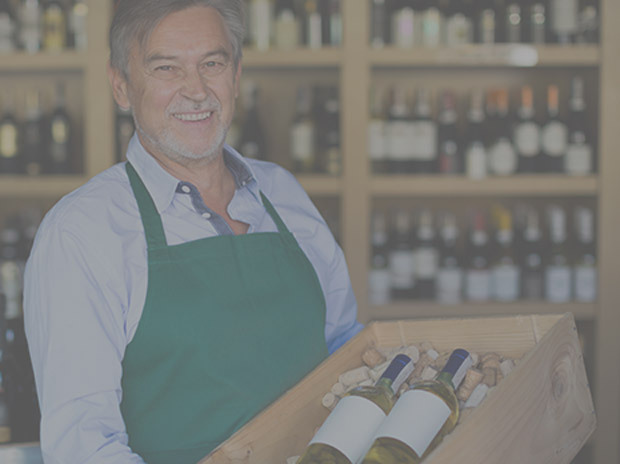 uses TAGFOR to obtain free drinks and/or promotions in that business, and also to look and acquire promotions, discounts and coupons to be used in the advertisers’ points of sale. A useful, convenient and fun double benefit to use every day and to share with friends!